I would like to you an active stand against crime and support the safety of everyone who calls the Greater Houston Area home by becoming a Safety Advocate! I will pick up my sign(s). 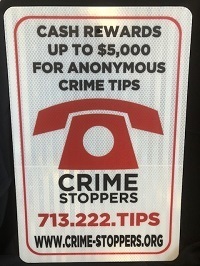 Please call 713-521-4600.